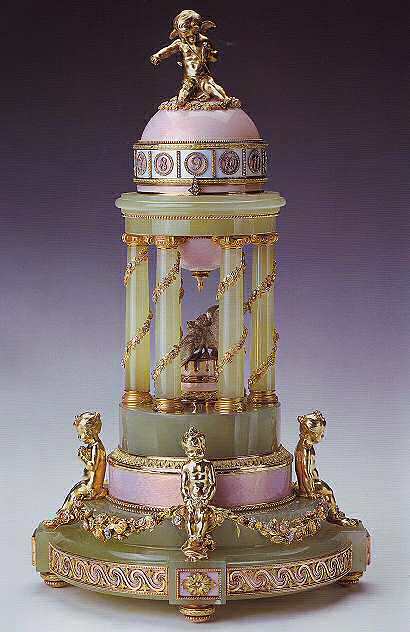 The 1910 Colonnade Egg is made of bowenite, quatre-couleur gold, rose-cut diamonds, silver-gilt, platinum, pale pink and white enamel. 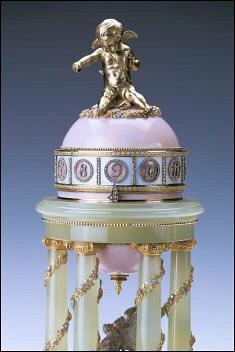 Designed as a temple of love, this clock egg commemorates the birth of the long awaited heir to the throne, Alexei, in 1904. 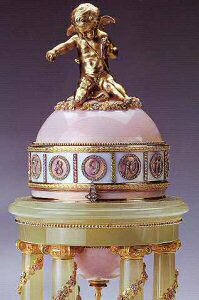 A silver-gilt cupid, a representation of the tsarevich, surmounts the gold Egg, which is enameled in opalescent pale pink and is encircled by a broad band of a white enameled dial, set with rose-cut diamond numerals. 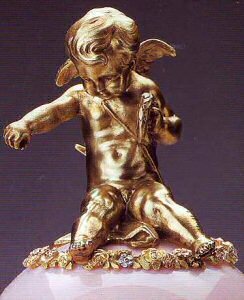 The little gold cupid originally had a twig in his hands that pointed the the our. Four silver-gilt figures, representing the Tsar's four daughters, are seated around the base and are linked by floral swags in quatre-couleur gold. Two platinum doves are perched within the circle of the columns. 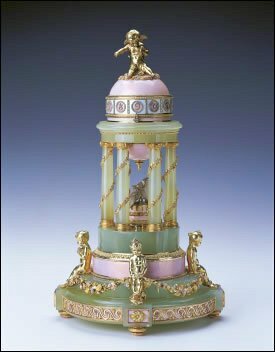 There has been confusion for a long time, over whether the Colonnade Egg was the companion piece for the 1907 Love Trophies Egg, as both Eggs were thought to celebrate the birth of the heir. Recent research however indicates that this Egg was presented to Alexandra in 1910. 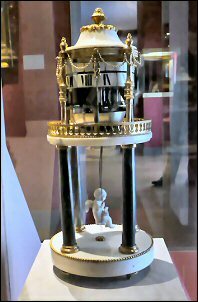 The Colonnade Egg demonstrates how important the birth of the Tsarevich was to the Romanov Dynasty. After the dead of his mother, Catherine the Great, Tsar Paul I decreed that women could no longer inherit the throne. Had the Imperial couple failed in having a son, Nicholas' younger brother Michael would have become Tsar. In 1927 the Egg was one of the nine sold by the Antikvariat to Emanuel Snowman of Wartski in London. In 1929 sold to Queen Mary, UK. 1953 inherited by Queen Elizabeth II. See for the above article, the Fabergé Research Newsletter, Summer 2013. 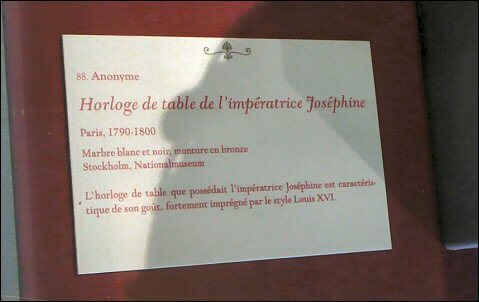 In December 2011 Peter Koppers from The Netherlands visited The Château de Malmaison near Paris, formerly the residence of Joséphine de Beauharnais, first wife of Napoleon I, and thus the first Empress of the French. 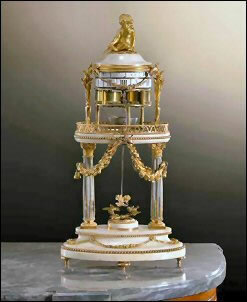 In the palace Peter noticed a clock he thought could well have served as inspiration to Fabergé. Below right, another clock in the same style.